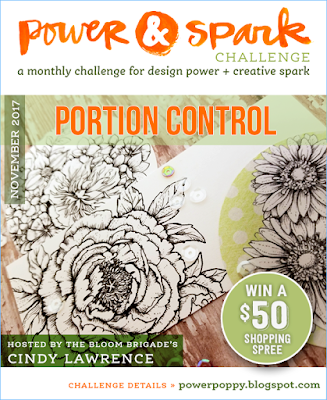 Another Friday has rolled around in a brand new month, so that means it’s a new Power & Spark Challenge at Power Poppy! This month Cindy is our hostess and she’s inviting us to use “Portion Control”, meaning - take advantage of part of your image and showcase it. Be sure to join us with your creation and you could win a $50 Shopping Spree at the Power Poppy store! 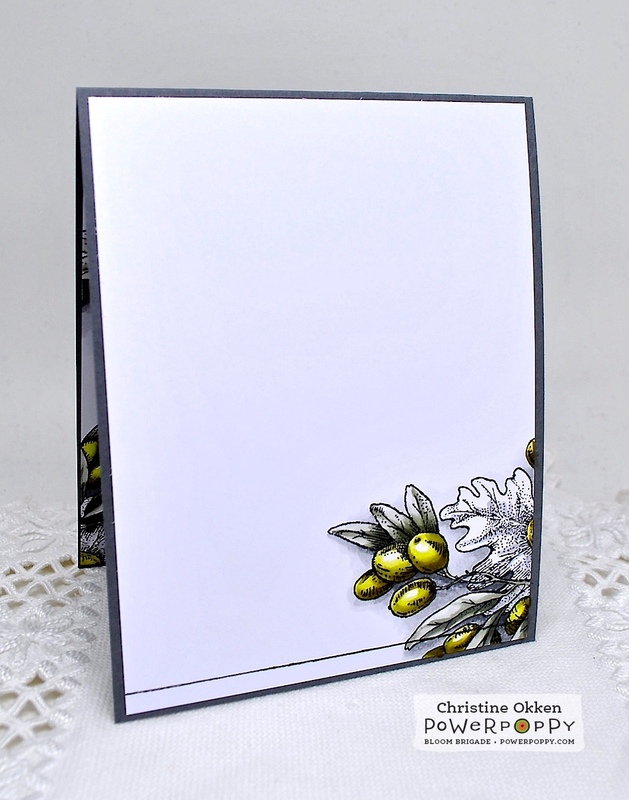 For my design I used Power Poppy’s beautiful set, Olive and Oak Expanded. I only stamped part of the image in various places on my panel of XPress It Blending cardstock, and then started colouring. I began by colouring the olive leaves and olives, then as I looked at it, I thought, "wait a minute! I really like the image being only partially coloured". So I have TWO ways to look at portion control, the stamping of partial images and partial colouring too! All I did to the oak leaves and acorns was add a bit of neutral shading, so they had a bit of definition, but primarily - it’s the pointillism and crosshatching that Marcy illustrated them with that really shines. I added some black twine and sewing to frame the image and added some highlighting to the Bible verse. This verse is a tender encouragement. 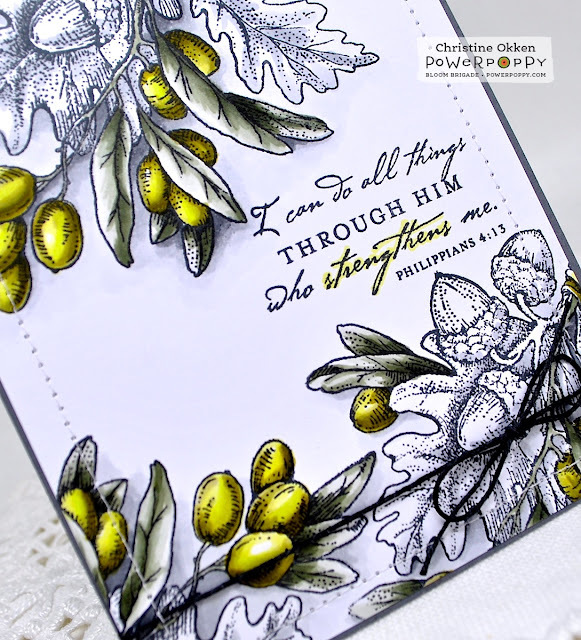 The olive theme and this verse reminded me of a devotion I had read by Lysa Terkheurst. I’ve added at the bottom of the post if you’d like to read it as well, I hope it encourages you too. I really appreciate her writing. Here is the inside of the design. I added a simple black line to ground the image and link it to the outside design. And below are the Copics I used. The olive tree is such a picture of why our hearts must go through the crushing times. The crushing times are necessary times. First, in order to be fruitful the olive tree has to have both the east wind and the west wind. The east wind is the dry hot wind from the desert. This is a harsh wind. So harsh that it can blow over green grass and make it completely wither in one day. The west wind, on the other hand, comes from the Mediterranean. It brings rain and life. The olive tree needs both of these winds to produce fruit — and so do we. We need both winds of hardship and relief to sweep across our lives if we are to be truly fruitful. The crushing times are processing times. and waiting some more. It is a lengthy process to be cured of bitterness and prepared for usefulness. If we are to escape the natural bitterness of the human heart, we have to go through a long process as well … the process of being cured. The crushing times are preservation times. This was one of the biggest “aha” moments for me standing in the shadow of the olive tree: crushing isn’t the olive’s end. Crushing is the way of preservation for the olive. It’s also the way to get what’s most valuable, the oil, out of the olive. Keeping this perspective is how we can be troubled on every side yet not distressed … pressed to the point of being crushed but not crushed and destroyed. I think I need to revisit these truths often: When the sorrowful winds of the east blow, I forget they are necessary. When I’m being processed, I forget it’s for the sake of ridding me of bitterness. And when I’m being crushed, I forget it’s for the sake of my preservation. I forget all these things so easily. I wrestle and cry and honestly want to resist every bit of this. Oh, how I forget. Maybe God knew we all would forget. And so, He created the olive tree. I do love your new blog look. Your header is gorgeous! And brilliant use of the olive and oak image. I like your two ways of looking at portion control. A fun challenge! 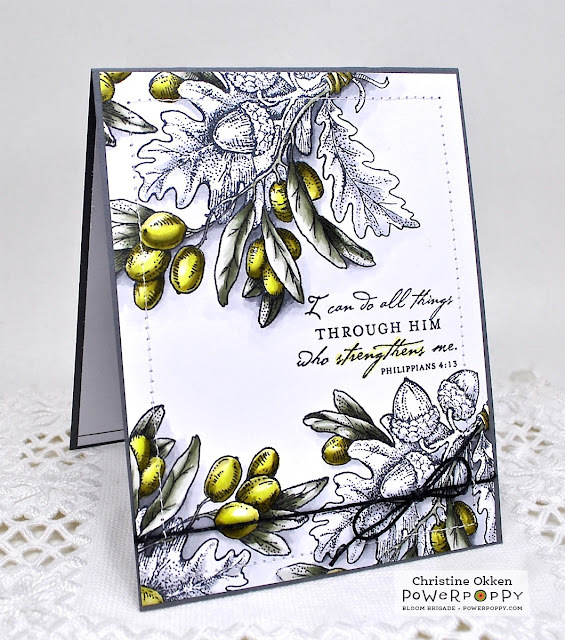 This card is BREATHTAKING!!! The coloring is perfection!!! I like Lisa's stuff, this was one I hadn't seen. Very pretty design and the olives look wonderful.